Advanced Trade Fitter Welder/Engineer, Carpentry Level 4. Licensed Building Practitioner, Site Safe. 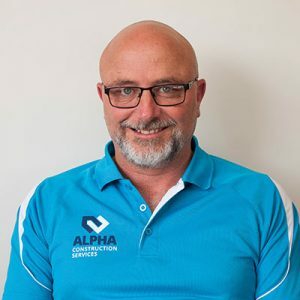 Brian is the Director here at Alpha Construction Services, and was born and raised in Whangarei. He’s an avid rugby fan, and enjoys spending the day out fishing or playing golf – but his true passion lies in spending time with his family. A Northland man through and through, Brian wouldn’t choose to live anywhere else: the local beaches and warm weather up here just can’t be beaten! For Brian, a large part of his enjoyment in the industry comes from meeting new people, discovering what their dreams are and seeing their dreams come to fruition. An active member of Sherwood Park Golf Club, Brian can often be found out supporting the Northland Taniwha, the Hora Hora Seniors, and (of course) the All Blacks. One of Brian’s most memorable projects with Alpha Construction Services was out at Helena Bay, where a vast number of elements had to be taken into consideration. Brian was involved in everything from managing the client relationship, co-ordinating staff and contractors, and keeping to strict deadlines and a high level of quality control. It was both challenging and rewarding; and the results were outstanding! Known to be a hardworking people-person, Brian is always dedicated, always ready to go the extra mile, and he wouldn’t dream of asking anyone to do anything he was not prepared to do himself. Jared is passionate about growing the family business, adopting new technologies and processes and driving a positive team culture. When he’s not committed at work, he thoroughly enjoys spending time with his wife, teaching kids on a Sunday at church, singing and having a good laugh. Originally from Hamilton, Jared moved to Whangarei for family reasons; and is now loving the lifestyle up here! Jared particularly enjoys solving business problems (especially when it comes to improving processes), using analysis and critical thinking. This gives him a great deal of satisfaction, and allows him to add value to his team members so that they in turn can add value to their clients and their projects. Supporting his team members and enabling them to work together effectively and efficiently is hugely important to Jared. Although he is kept very busy in his current role, Jared is also currently studying towards a Graduate Diploma of Chartered Accounting; and is already a provisional Member of Chartered Accountants Australia New Zealand (CAANZ). Jared is known about the office as a systematic, hard-working, efficient, dedicated and professional team member, with a focus on streamlining human resources and accounting processes, while also implementing highly efficient job costing systems. New Zealand Certificate in Level 4 Carpentry, Licensed Building Practitioner BP123164. Nathan is as passionate about training and upskilling his team members as he is about motivating them to get the best results for each and every client. The joy of seeing new projects take shape never loses it’s impact for Nathan, and he truly enjoys his role within the family business. In fact, it was during the construction of one of Alpha Construction Services’ large projects at Helena Bay that Nathan completed his apprenticeship. It was during this project that Nathan learned a high degree of accuracy and quality, what it means to work in a large team environment, how to achieve goals within programme timeframes, and how to ensure that all client requirements are met even when it means changes to the original design. Nathan is a sports fan, and plays a range of sports himself; including rugby and basketball. When he’s not out on the field himself, he’s a keen supporter of the Taniwhas and the All Blacks, and can often be found cheering on players in the NBA. It’s not always all about sport though, as Nathan’s got a bit of an eye for engines too: cars are a keen interest of his. New Zealand born and bred, Nathan arrived in Whangarei with his family, and hasn’t looked back since. 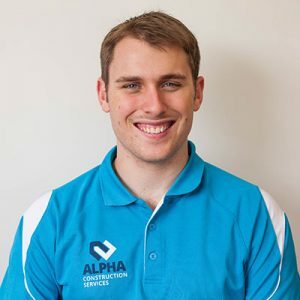 Training keen and quick-learning apprentices is one of Nathan’s ultimate pleasures, while collaborating with each client to achieve the most satisfying outcomes is what keeps him motivated and enthusiastic every day. Known to the team as a strong leader, Nathan is particularly skilled at being an effective bridge between his team members and the client, and is a competent and efficient carpenter. Nathan is a great person to work with, often finding solutions to maximise project timeliness while helping to minimise resource wastage at the same time. The construction of a residential home at One Tree Point in 2014 was one of Nathan’s most significant projects, as it was his first opportunity after becoming a fully qualified carpenter to construct a residential dwelling from start to finish. The client was impressed with the outcome, and Nathan has continued to grow in skill and experience! Certificate in Payroll Practice level 4. Lesa is Alpha Construction Services’ co-Director and company administrator; the efficient, friendly face many of Alpha’s clients come to know well! When Lesa’s not busy keeping everything in order at work, she loves spending time with her family, playing the piano and developing her artistic painting skills. Born in Huntly, Lesa grew up mostly in Rotorua, but after spending 12 years in the Waikato, a family change meant a move to Northland was on the cards. At the end of 2001 the family travelled up to Whangarei, where they formed the team at Alpha Construction Services. Lesa truly enjoys working with family, seeing it as a huge bonus to her lifestyle. Working in a team environment towards a collective goal gives her great satisfaction, while being numbers-orientated makes her a real asset! Lesa also enjoys the challenges of a busy office environment; where her cheerful nature and faultless attention to detail brings a welcome atmosphere to the company. Lesa gets most satisfaction from the happiness of their clients: she particularly recalls The Falls Village project, due to the sheer size of the build! It was a good test of their abilities as a professional company, and they completed it with a happy client. This is always satisfying for Lesa, and is a large part of what makes her role so enjoyable.